Two remarkable “thought guides” recently joined forces to help you and me access the way of thinking that can literally transform our worlds. 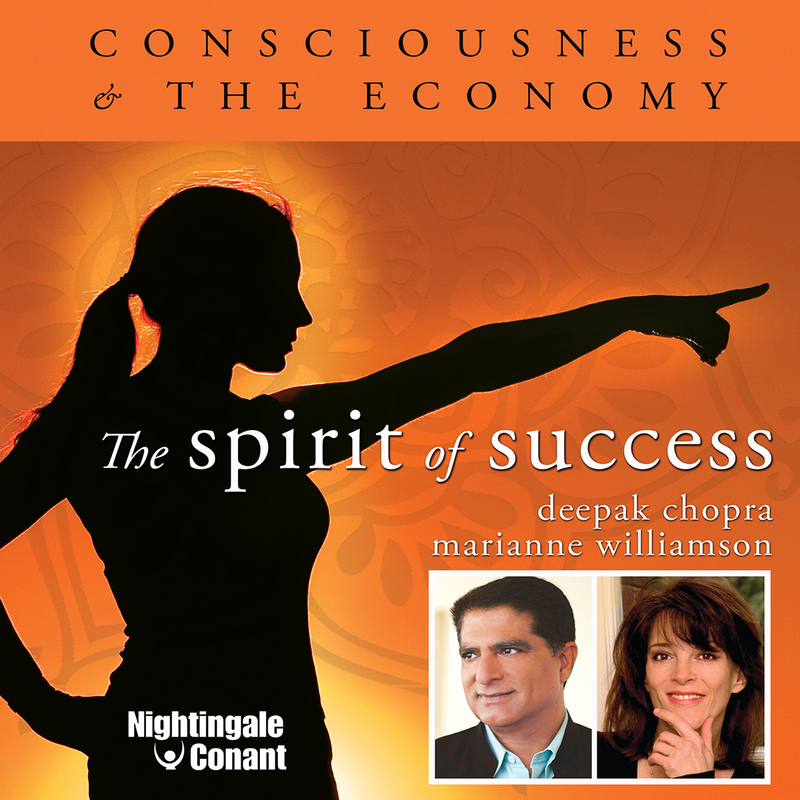 World-class students and teachers Deepak Chopra and Marianne Williamson have gathered and simplified the best spiritual teachings and practices from the East and West into an understandable and easy-to-apply message for NC customers… for you! They share ground-breaking inspiration and thought techniques that will help you tap your inner strength to create the life you yearn for… the life you deserve. Published exclusively through Nightingale-Conant, this seminar recorded live, and now available on both CD or as Digital Download, is titled The Spirit of Success. This miraculous program can open the doors to joy, connectedness, and a sense of abundance for you no matter how many worldly distractions you have in your life. and Marianne and Deepak are here to help pave the way. You see, most people use acquired knowledge and adopt a “take the bull by the horns” approach to tackle challenges and move up in the world. But others use their inner intelligence to overcome the everyday challenges they face. This is, by far, the more peaceful and productive approach. According to Deepak and Marianne, tapping into, and then acting on, this inner intelligence creates far less stress than using acquired knowledge only. It also expands your imagination, putting you in a transcendent state that creates miracles. In The Spirit of Success, Deepak and Marianne explain that you don’t have to work harder or do more to create abundance, happiness, and peace. Even when you’re facing dire circumstances, you can create miracles. It’s nothing more than a thought process. Since one way of viewing life costs you the vision of the other, you should be careful about where you place your faith, because if you have faith in the troubles of the world, you’re more likely to dwell on and experience problems of your own. But with this program, you’ll rise up, greatly expand your sense of possibility, and, yes, create miracles. According to Marianne, if you do one thing for a minimum of five minutes a day… you allow the vibrations of what you want to download. And within 30 days, the situation or outcome will be “alchemized.” You can’t accomplish that by denying what’s going on. You do it by transcending it. Dr. Deepak Chopra is acknowledged as one of the world’s greatest leaders in the field of mind-body medicine. He is the co-founder of the Chopra Center for Wellbeing, a place where individuals from around the world come to balance, heal, and transform. Through the Chopra Center, Deepak is revolutionizing common wisdom about the crucial connection between body, mind, spirit, and healing. His mission of “bridging the technological miracles of the West with the wisdom of the East” remains his focus. According to Deepak and Marianne, there is no order of difficulty in creating miracles. And it starts with tapping into your inner wisdom. They teach you to use spiritual perspicacity as a way to problem-solve in your life. Because when you know that the same simple principles apply whether the problem is a big one or a small one, you surrender your limited thoughts. This allows a whole new set of solutions to arise. Actually, Marianne and Deepak help you build your faith, rather than your belief. I’m not talking about religious faith here; I’m talking about faith as an aspect of consciousness. Marianne and Deepak show us that, in any given situation, we have faith in one outcome or another. And that faith plays a large role in what we experience— think Law of Attraction. You know that there’s more to life than you’re currently experiencing. And you know that you are capable of more. That’s why you have this little picture in the back of your mind that never completely goes away. You know the one…the image you have of you living at your healthiest, happiest, and most radiant levels. You’re doing the things that you love, you are always at your best when you do them, and you’re serving others. The problem is, you think if you were going to live like that you should have done it many years ago. Or you dismiss the idea because you think you’d have to go back to school to achieve it. Or you tell yourself you’re not good enough to achieve your dream. You push the image away because your ego tells you that it’s much safer for you to play “small” than it is to live the grandest expression of who you are. Still, the image keeps coming back. Marianne explains that the picture keeps coming back because it’s natural to your system. It’s an undeletable file. And all you have to do to make it happen is dare to let go of who you are not. The information Marianne and Deepak share with you helps you finally find and rest in the truth of your being. If you’ve tried seeing things in a new light before, but it didn’t work, don’t worry, because The Spirit of Success includes plenty of tools you can use in your everyday life. When you think the way that you were taught in school, you are logical, analytical, and sequential. But The Spirit of Success teaches you to think from a totally new perspective. When you look at things from an inner or spiritual perspective, your thought process completely changes. Through a combination of Western and Eastern spiritual traditions, Marianne and Deepak show us that we have it backwards when it comes to overcoming challenges and improving the quality of our lives. If you’re stressed or worried, or experience a negative emotion, your mind is frenetic and so are the actions you take to try to resolve challenges. In short, Marianne and Deepak will change your way of thinking as they explain the surprising real reason why we don’t live up to our potential. To say that The Spirit of Success is an eye-opener is an understatement. What I’ve just described is the tip of the iceberg. There is so much more. You’ll learn why the greatest service you can provide to yourself and others is to reduce yourself to zero, and you’ll discover what you should do in any given moment to have lower thought forms simply fall away. You’ll also learn how to be infinitely more creative and why intention is the most powerful force in the Universe and how to use it change your life. Why continue living below your full potential, when Deepak and Marianne can put you in touch with the truth of who you are—which can lead you to financial abundance and total well-being? I hope you won’t delay. If you want to do more than just manage your current situation, this program is for you. As you’ll hear on Session 1, your life can be transformed only by addressing the wrong-mindedness that lies at the core of your problems. This is your opportunity to shift into right-mindedness. Get your copy of The Spirit of Success today. I want to tap into my inner strength to create abundance and total well-being, no matter what is going on around me! The Spirit of Success at the special price below. — I can select one of two ways of ordering.